My mother's 1950s era Rolleiflex. Unbeknownst to me the son was given an opportunity to buy a book and he chose one about the history of photography. 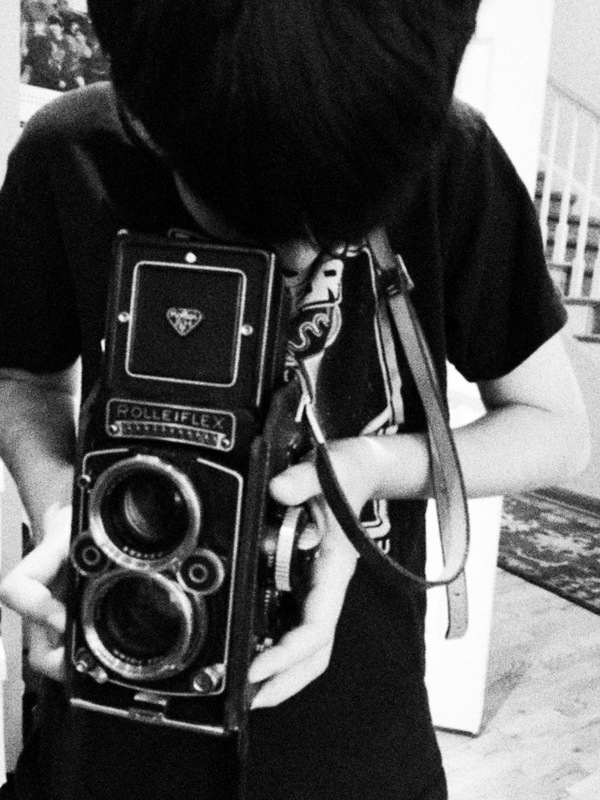 I found him online looking at vintage cameras. He was excited he could purchase an old-timey camera for a modest amount. Little did he know I had inherited two iconic cameras from the golden age of lots-of-futzing photography. I had the pleasure of showing him my mom's old Rolleiflex and explaining how it worked, why the image in the viewfinder was upside down, why two lenses. I also showed him my dad's old Leica, explaining what a rangefinder was and how this early camera became the design model for generations of 35mm cameras. Despite my bohemian pretensions and veneration for these old-school classics, I am not in the fancy-camera game anymore. I have a micro four thirds, interchangeable lens digital camera but generally use the camera most often at hand -- my phone. I wish I could be more artsy and make some argument against digital photography. The sheer fun of being able to click away and see the results instantly is just too much joy.